Two years ago CMI established formal relationships with the China Building Materials Federation (CBMF). CMI visited the office of CBMF in Beijing and was introduced, not only to the highly efficient and well qualified staff of CBMF, but also to a large number of high profile Chinese manufactures. During this visit we were provided with the opportunity to meet with the China Standards office, at which time we discussed plans for the harmonisation of the Chinese Standards with International Standards as well as Australian and New Zealand Standards. Further to this, CBMF made it possible for us to visit the CTC Test laboratories headquarters and discussed, at length, with CTC the testing requirements needed to meet Australian and New Zealand testing standards. We were very impressed with the desire expressed by both CBMF and CTC to ensure that building products and testing facility’s meet the requirement of the Australian and New Zealand Building code. 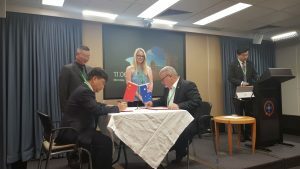 Over the past two years CMI has worked, on a regular basis with CBMF on providing assistance to Chinese manufacturers wishing to introduce their products into the Australian and New Zealand market place. Recently CBMF has advised CMI that they are founding the Guocai Test and Certification Service Co.,Ltd. . Guocai is wholly owned by the China Building Materials Federation and consequently is under the direction of the government of the Peoples Republic of China (PRC). Guocai Test and Certification Service Co.,Ltd. will be unique, in that it is the first time a government run building product testing and certification service has been established in the PRC. The depth of concern expressed by Guocai in ensuring that only high quality, fit for purpose, building products are certified for export has led to CMI feeling great confidence in the future of this cooperative agreement. Moving forward CMI and Guocai have set in place checks and balances that will ensure that any product that is certified through our Cooperation will meet the Building Code and be fit for purpose. Further to this the establishment of ongoing monitoring of the manufactures in China by Guocai, and the extra annual surveillance and testing of certified product as required under the CodeMark and Watermark schemes by CMI, will give the market place confidence and peace of mind. CMI look forward to growing this relationship with Guocai, and working with Manufactures in China and with the regulatory bodies in Australia and New Zealand to ensure that the products sold under our certification banner will be of a high quality and certified under a government regulated frame work that guarantees accountability and oversight. CMI congratulate the China Building Materials Federation for their foresight in the creation of Guocai. And congratulate the management and staff of Guocai for taking the initiative of travelling to Australia and New Zealand to meet with the relevant industry and Government bodies as a means of expanding their knowledge of the Code Compliance requirements in each country. CMI Advisory Notice: Surveillances, Renewals & Multiple Product Certificates.